Companies are interesting creatures. In a legal sense, a company is a person, as it has all the rights that you and I do. A company can own property, file lawsuits, pay taxes, and generate profits. That last criteria can be a challenging one. In order to make money, a business has to stand out and establish itself in a crowded market; if it doesn’t, it will cease to exist. This is where things get tricky fast: a person can rely on their personality to close deals and win the day. A company, on the other hand, can’t do the same. In fact, a company can establish itself through savvy marketing and advertising. The key lies in building a charismatic, recognizable brand — the identity and character of a company. To do so, you need a style guide, which will build a consistent, engaging presence that consumers can easily identify as your organization. Without consistency, there are no customers. This is as true for your company’s offerings (services or product) as it is for your branding. While individual humans can sometimes be inconsistent in their personal lives (someone can be equal parts messy slacker and genius inventor), companies get no such slack. Instead, they are held to a higher standard, and must project a unified image and message. The difficult part lies in coordinating various teams. Getting your marketers, designers, and copywriters on the same page requires a serious, thoughtful effort — which includes brainstorming the answers to a number of questions. How do you want customers to perceive you? What is your company’s voice? How can you elevate your company’s backstory and brand above that of competitors? A style guide simplifies this process. Your design and marketing staff can always refer back to this document to ensure that everyone is on the same page and creating a cohesive identity. For a large corporation, especially those with teams scattered across different time zones, a comprehensive guide saves a lot of time and frustration. Proper prior planning will reduce late-night phone calls, countless rounds of edits, and may even keep executives and creatives from clashing with each other. Even if the latter is too much to hope for (there may always be a rivalry between the creative and the business sides), a style guide will at least tackle the smaller questions, such as typography, color schemes, and design themes. At the very least, this frees up your teams to worry about bigger issues. One architectural firm’s advertisements are dark, somber, and serious, featuring past projects heavy on outdated motifs, like Art Deco and Brutalism. Its email newsletters are poorly formatted, with different fonts and mismatched letters and colors, while its website looks like it was built on Geocities circa 1999. This company’s personality? Stodgy, confusing, and long past its prime. The other organization, however, is perceived as cutting-edge. Its marketing materials are glossy, full-page renders of planned and ongoing projects, outlining the company’s past, its environmentally-friendly ethos, and compelling story as a family-owned firm with loyal, lifelong employees. Its website is a logical extension of its physical brochures, featuring a similar color palette and visual themes, the same typography, and a consistent message of optimism and hope. This company’s personality? Sleek, streamlined, and forward-thinking–design for the future. As an example of organizational personalities, it might help to look at media outlets — which, despite their size and readership, all utilize style guides. News site Vox, for example, is your talkative, intelligent, and endlessly interesting friend who explains without resorting to condescension or mansplaining. In contrast, The Guardian, befitting its reputation as a venerable newspaper, is a straightforward resource that occasionally dispenses opinions but is otherwise detailed, steady, and objective. In much the same way, a style guide will create and categorize themes to create your organization’s visual (and perhaps audio) identity. 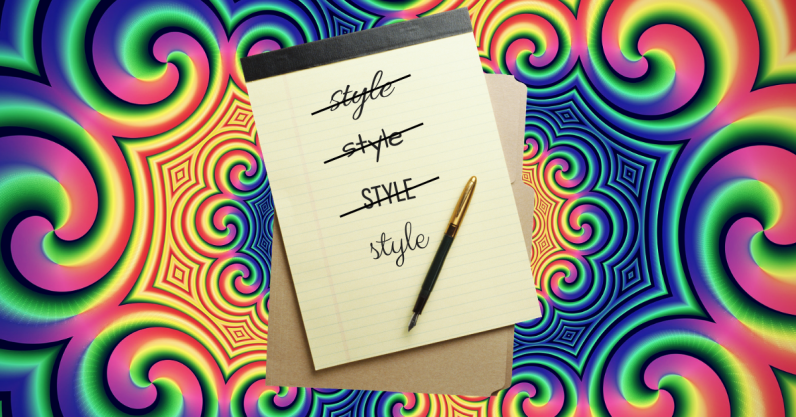 Done right, your brand’s unique style will serve as a shorthand for how customers see you. Perhaps company A, a maker of surfwear and swimwear, is hip, easygoing, and environmentally-conscious, while company B, an engineering firm, is authoritative, expert, and professional. Expressing this personality through design and marketing is key. There are several elements to any brand style guide: voice, imagery, typography, and color palette. Not all qualities are strictly visual: voice falls squarely in the realm of language and will require the help of copywriters, who often work in tandem with designers and art directors. All companies should begin with a brand story. As award-winning marketer Neil Patel explains, your brand story is the reason for being, and in order to connect with customers, has to go beyond simple profit. One great example is Patagonia: founded as a small climbing outfitter in California, Patagonia prides itself on being a conservation-minded company that treats its employees, customers, and the planet with care. Towards that end, it donates time, products, and one percent of sales to grassroots environmental groups, recycles and repairs worn gear, and reduces its carbon footprint as much as possible. Another notable element is your logo, which is best described as the face of your company. Your logo will adorn all your products and marketing materials, and it will be the first thing that the public sees — a sort of visual shortcut to your company. As such, it’s crucial to design your logo thoughtfully, and to play with its variations to discern which backgrounds, colors, and sizes are best. For instance, a minimum size is necessary, because if a logo is too small, it will not render accurately or clearly. Colors, themes, and layout are another important factor. As we can see in Barnes and Noble’s surprisingly comprehensive guide, no detail is too small: on pages 40-45, the company font is rendered in a range of primary and secondary colors. Interestingly, each secondary color includes two shades: for instance, a shadowed, dark red twinned with a bright, fiery red-orange. This contrast is a clever one, as it emphasizes soft and energetic characteristics, an interesting dance between two conflicting characteristics. Lastly, it’s helpful to have a digital section, which concerns user experience (UX) and user interface (UI) for online customers. This would be very detail-oriented, touching on topics such as the amount of white space, button design, and layout (margins, alignment, and format). For instance, what color and size will your buttons be? What effects will you incorporate? What options and questions will you include in your forms? These details may be more important than you think, given that online sales are an increasing percentage of the retail market. Remember that a style guide is an important but individualized document; organizations need to adapt it to their needs and resources. Just because Uber or Airbnb have detailed, longform guides doesn’t mean your business needs one as well. For smaller companies, it might make more sense to sit down with a designer and writer and create a short, five to ten page resource. Whatever your situation may be, a style guide is an indispensable resource, especially as your business grows. Past a certain point, it’s no longer practical to run hundreds of designs past a single person — especially if you have multiple managers overseeing teams. Instead, you need standardized rules and guidelines so that your staff can all easily stay on the same page.